George Mosse was a cultural and social historian best known for his studies of Nazism. He was born in Berlin. His family's media empire included the newspaper Berliner Tageblatt. He was educated at the Mommsen-Gymnasium and the elite Schule Schloss Salem boarding school. In 1933, with the rise of Nazi power, the family was forced to flee Germany and separated. His mother and sister went to Switzerland, his father moved to France. Mosse attended the Quaker Bootham School in York, England and then Cambridge University. 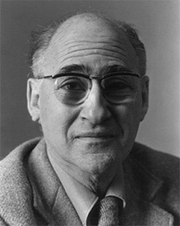 In 1939, he went to the USA with his family and completed his undergraduate studies at Haverford College in 1941. He obtained a Ph.D. at Harvard University in 1946 with a dissertation on 16th- and 17th-century English constitutional history, subsequently published as The Struggle for Sovereignty in England (1950). Mosse joined the history faculty at the University of Iowa, where he focused on religion in early modern Europe, and published a brief study of the Reformation that became a widely-used textbook. In 1955, he moved to the University of Wisconsin–Madison and started to teach modern history. His book The Culture of Western Europe: the Nineteenth and Twentieth Centuries, An Introduction (1961) which summarizes these lectures, also became a popular textbook. Prof. Mosse taught at the University of Wisconsin for more than 30 years, rising to became John C. Bascom Professor of European History and Weinstein-Bascom Professor of Jewish Studies, while also holding the Koebner Professorship of History at the Hebrew University of Jerusalem. He also became a visiting professor at University of Tel Aviv and Ludwig Maximilian University of Munich. After retiring from the University of Wisconsin, he taught at Cambridge and Cornell University. Prof. Mosse was the first research historian in residence at the U.S. Holocaust Memorial Museum. He co-founded and edited The Journal of Contemporary History with Walter Laqueur. George L. Mosse is currently considered a "single author." If one or more works are by a distinct, homonymous authors, go ahead and split the author. George L. Mosse is composed of 9 names. You can examine and separate out names.